The history of St Vincent’s Church is a fascinating one. It sits in an area of the city known as the ‘Crofts’. At the heart of the iron and steel industry, the area was populated by Irish Catholics who were attracted by the work available in the prosperous cutlery and tool industries. The area they settled in was overcrowded and poor. Despite the hardship, funds were raised for the building of a church and the foundation stone of St Vincent’s was laid in 1856. During this era, Sheffield also experienced a large influx of Italian immigrants. It was a hard time in Italy and many chose to leave their homeland in search of a better life. Small communities sprang up around the UK, usually known as ‘Little Italy’, where Italian families helped each other, marrying within their community and maintaining their culture and language. West Bar was Sheffield’s Little Italy. Many of the people there were skilled mosaic and terrazzo workers and marble fixers. Quite an industry sprang up as a result. Terrazzo can be used on floors and walls. It consists of different coloured marble chippings set into cement with colour pigments added, giving a marbled or mosaic effect. There is a lengthy series of processes involved in its creation. The final polishing process was all carried out by hand using stones wedged into a cast iron frame, on the end of a long pole. This contraption was known as a ‘gagliara’, meaning ‘strong and vigorous movement’. It was extremely demanding physical work – all of which would be done today using machines. 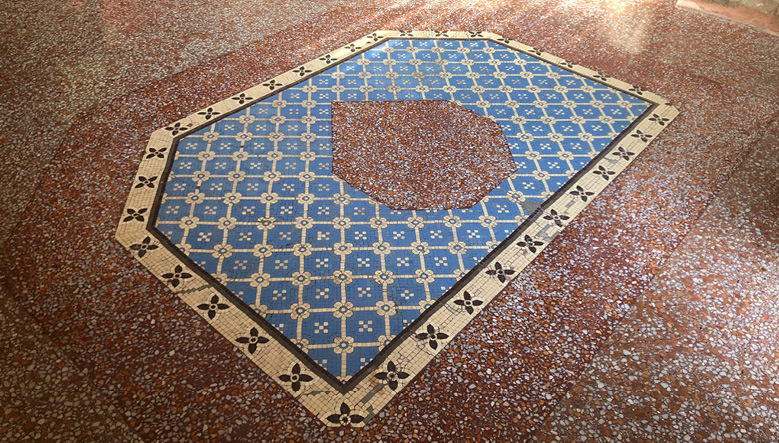 Today, fine examples of original terrazzo and mosaic can be found around Sheffield as a direct legacy of these Italian immigrants. The church celebrated its centenary in the 1950s in fine style but, by the 1980’s, there was concern for the future of St Vincent’s. Its parishioners had moved away from the immediate area and were raising funds for a new church nearer to their homes. A decade later, the Vincentian Fathers withdrew from Sheffield and, in 1996, the church closed its doors for the last time. By 2016, the fabric of St Vincent’s had entered a rapid decline. Water ingress and general neglect of the building was taking its toll in quite a dramatic fashion. 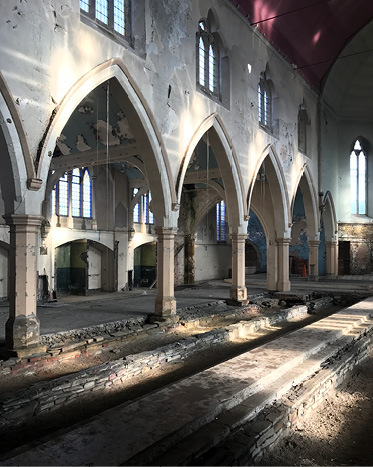 Fortunately, a new purpose had been found for the building which meant its decline would be halted and new life could be breathed into the church. The location of the church was to be its saviour; it was ideally situated to be incorporated into the expansion of the university’s facilities. 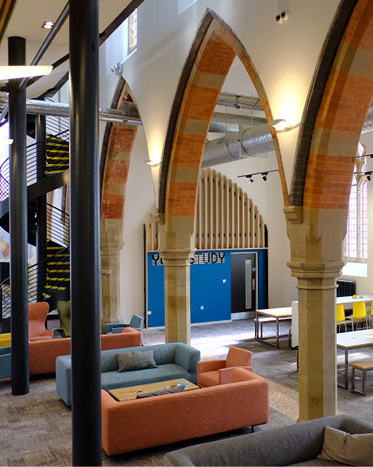 St Vincent’s was to become part of the student accommodation, providing a social hub for the residents. Stone Edge was brought in as a specialist sub-contractor with responsibility for the heritage and conservation elements of the project. 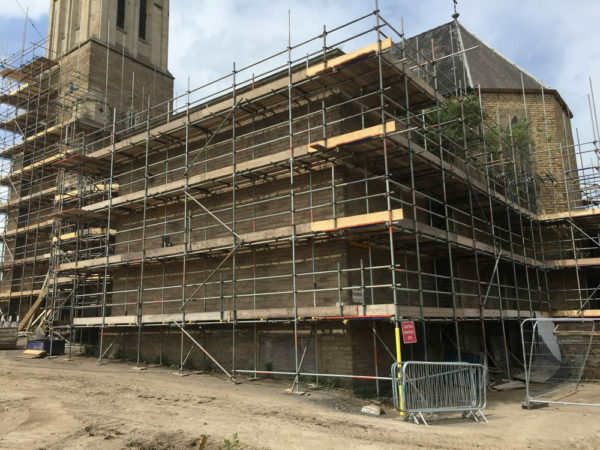 Externally, the church needed a wide range of repairs. 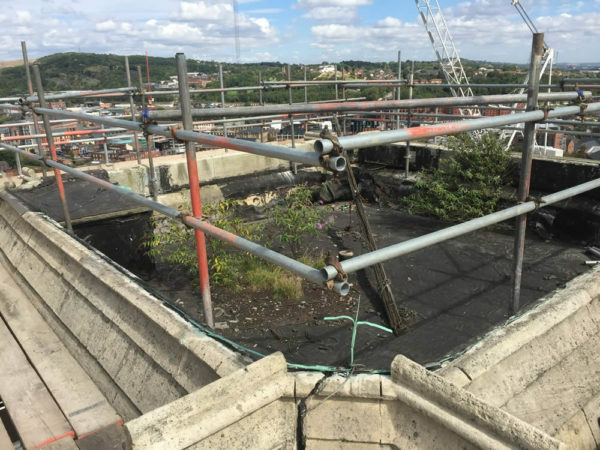 We undertook the rebuilding of a high-level parapet, carried out stone repairs, repointed where necessary and carefully cleaned the façade. A number of techniques were used; delicate details such as carved head stones needed to be poulticed and then cleaned with the DOFF system. Conservation of the historic metalwork around the building’s exterior was also undertaken, with the railings removed, cleaned, repaired and reinstated. Windows were repaired, cleaned, re-leaded where necessary and repainted. 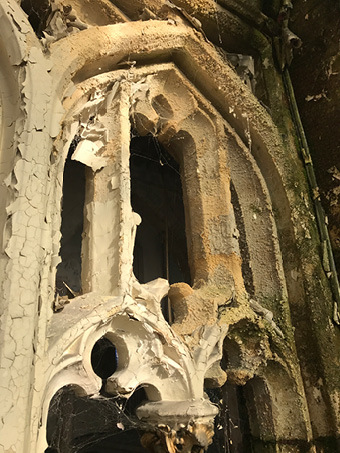 The west window required particular attention, as it was structurally unsound. Substantial restraint straps were installed inside the window to stabilise the structure. These were carefully positioned in line with the transoms, in order to minimise the visual impact of the intervention. 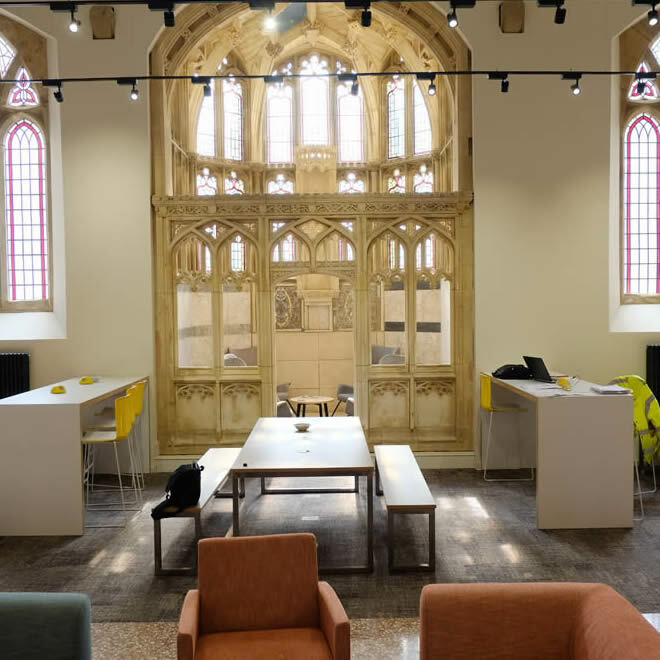 The interior of the church presented a variety of challenges for our team, who carried out some extremely highly skilled work. It was very important to us that a conservation approach was taken to the works, to ensure that the original intentions were not lost when the building was re-purposed. 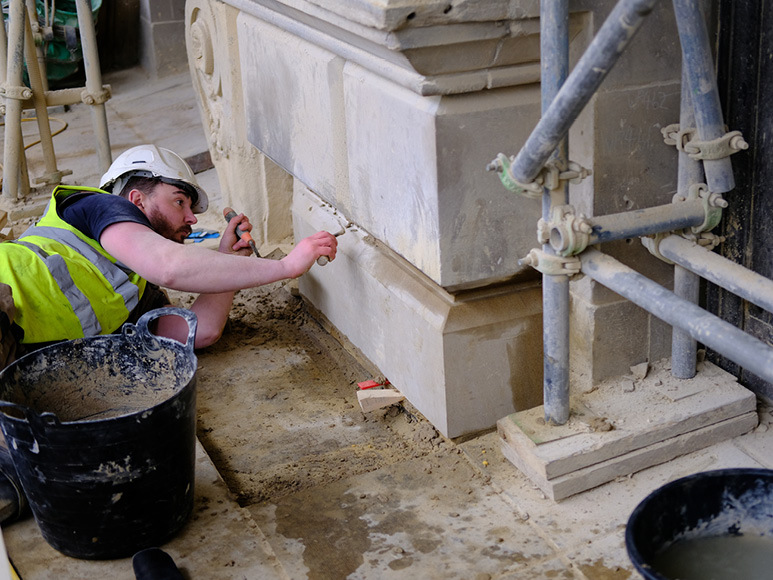 Following dialogue with the conservation team at Sheffield City Council and after lengthy trial processes, the paint was removed from the stone columns and brick arches. To achieve this, we employed the JOS system, which is an air abrasive, using the finest possible medium. Similarly, structural oak beams were delicately cleaned, removing layers of paint and allowing them to breathe again. 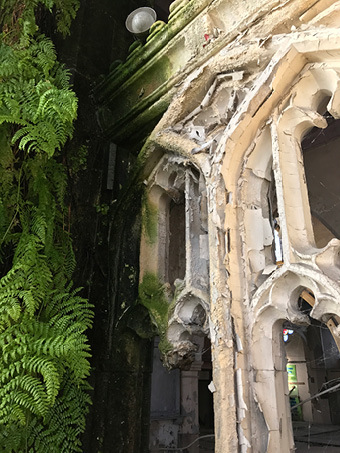 The Chapel of the Sacred Heart was in a terrible state, with ferns and other plant growth thriving in the damp. Vegetation was removed and the structure was returned to a water-tight condition. 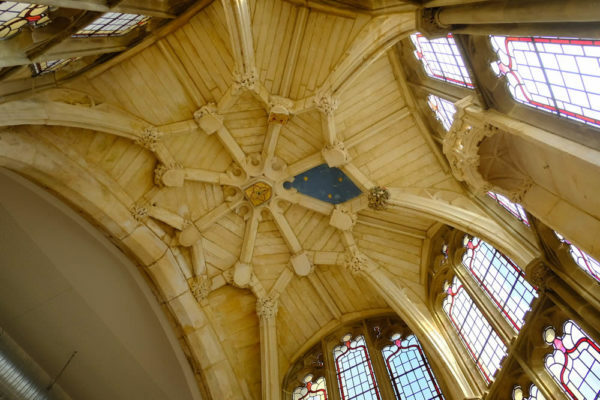 The stonework was cleaned and careful consideration was given to the finish of the ceiling. This was unusual in that it was stone, painted to imitate timber panelling. Some of panels were finished in a starry sky pattern. Much of this was lost and flaking, but we managed to carefully stabilise and conserve the remnants of one painted panel to show the original finish. St Vincent’s had benefitted from the craftsmanship of the early Italian immigrants, boasting some beautiful terrazzo, mosaic and marble floor surfaces. 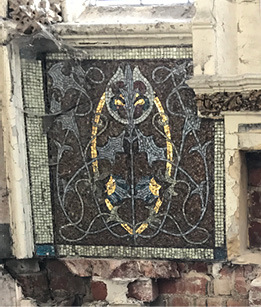 Using the skills of our in-house mosaic conservator, we were able to rescue many of these surfaces, conserving and restoring as appropriate. 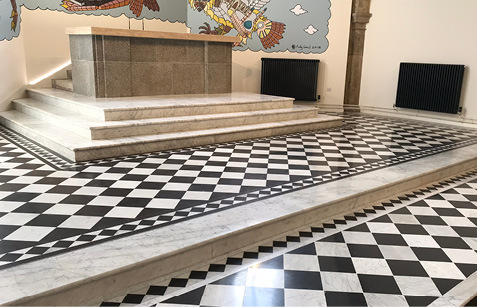 We were able to advise on the best approach to the re-levelling of the church’s entrance, where there was a risk of the original mosaic being lost and replaced with a concrete floor finish. 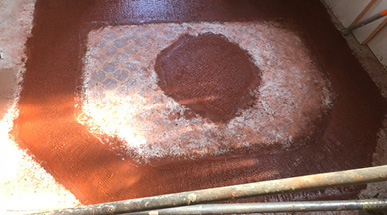 Instead, we lifted the mosaic and excavated the substrate to achieve the required new level. 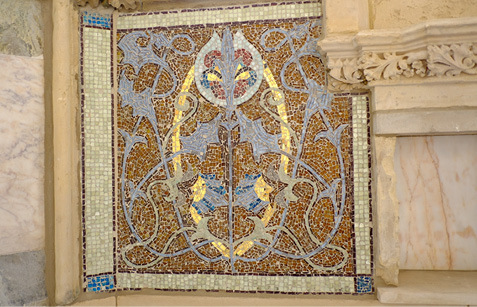 Our specialist mosaic restorer then re-laid the mosaic. A flexible approach was required here; in order to carry out this work in a busy construction environment our team worked out of hours to complete the project and save an important historic feature. Elsewhere, terrazzo was cleaned, repaired and reinstated where appropriate. Victorian tiled floors were cleaned and repaired, and marble was returned to its former glory through careful cleaning. 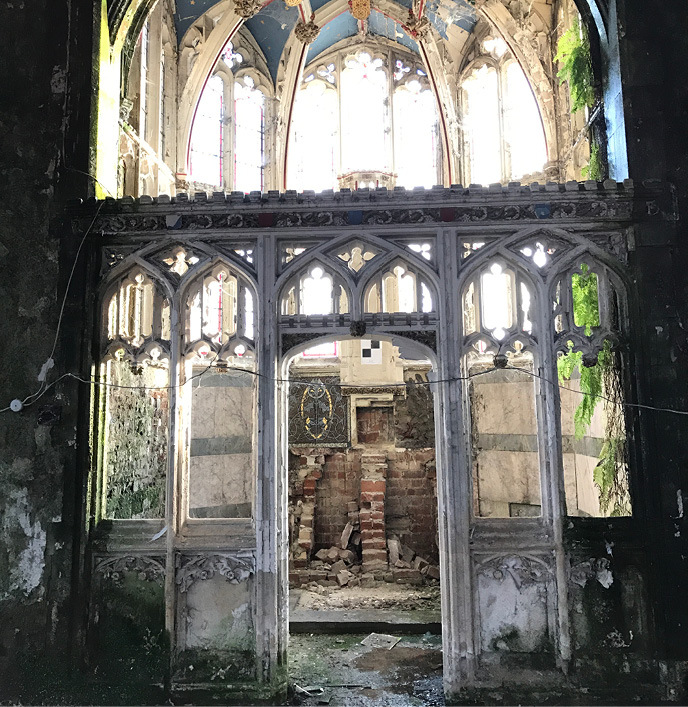 Gilded mosaic panels in the Chapel of the Sacred Heart had suffered damage as a result of water ingress and encroaching vegetation. 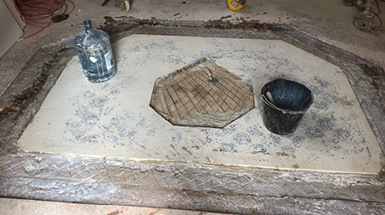 The panels were carefully removed, strengthened with reinforcing grout, repaired and reinstated in their original position. Nearby original marble panelling was in danger of collapse. It was taken off and reinstated with stainless steel fixings. 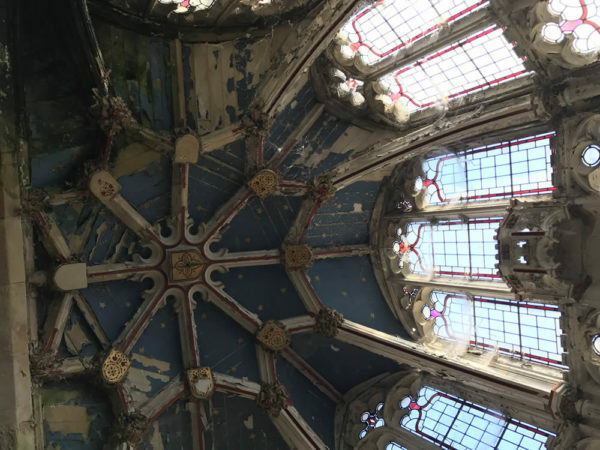 It is rare that we have the opportunity to help rescue a structure and its delicate decorative features from so close to the brink. We are proud of the work carried out here, and it gives us great pleasure to know that this new vibrant facility will be enjoyed by thousands of young people in the years ahead. more of our stories in our portfolio.